There are many types of pool enclosures, from fixed work models that allow you to continue to enjoy the use of the swimming pool all year round, to simple covers that protect the pool surface during the months when the pool is not in use. Installing a pool cover increase the water temperature in 8-10° C. This is possible due to the materials used, that have the mission of capture solar heat and keep it on the inside of the cover. 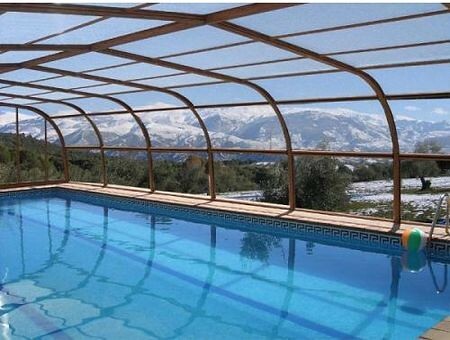 Swimming pool enclosures also will help you with the responsibility that you have to clean the pool when it is filled with leaves, dust, and any number of things that will be collected on the surface of the water, which will make you to clean it constantly, remove water, fill it again, clean the walls, etc. Pool covers will help you solve all these things, and there are several types on the market that serve to each of your needs or all together at times. They are expensive, but they will be a good investment. Another of the many reasons why the cover pool is needed is for example, if you have pets or small children, they can not always be watched and if you have a good cover this will prevent that they might fall there causing a completely terrible accident. – Enjoy more months of your pool, the water temperature remains pleasant for longer. Take advantage of the health benefits that offer swimming in the pool. – Save on water, avoid evaporation. – Reduce the use chemical products for the maintenance of your pool water. – Because it is covered, will fall less objects in your pool so it will have be cleaned less frequently. – The pool cover will prevent accidental falls into the pool whether of children or animals. – Save energy in heating your swimming pool. – A heated pool adds value to your property. Pooldeals.com: Cover-Pools invented and patented the automatic pool cover 50 years ago. We are the leading manufacturer of automatic and manual safety covers for pools and spas. 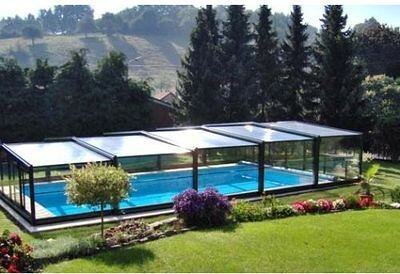 Aquashield.com : is a manufacturer of state of the art Telescopic Pool Enclosures, Pool Covers and Sunrooms. They have the only patented telescopic enclosure design in the United States.